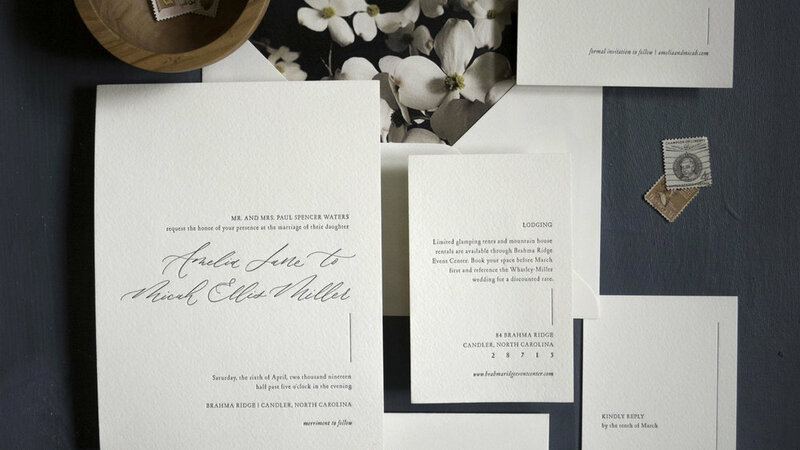 Luxury semi-custom wedding stationery for the design-conscious Couple. ready for you to customize. Finish any invitation or save the date suite with extras and adornments for further customization. Choose from envelope liners, wax seals, recipient addressing, or additional design services such as custom maps or venue illustrations. Sometimes you just need to see something in person. Samples are available to better demonstrate the quality of design, paper, printing. Choose 3 of your favorite suites or sample all products. Although we only stock certain combinations of colors and printing processes in samples, all products from The Curated Collection are available with letterpress or foil printing and any combination of envelopes and ink/foil colors. If possible, we recommend purchasing a set of all suites to see the biggest variety of print, paper, and color combinations.